Basecamp founders Jason Fried and David Heinemeier Hansson explore the "work from home" phenomenon and show precisely how a remote work setup can be accomplished in Remote. The Industrial Revolution's "under one roof" model of conducting work is steadily declining as technology creates virtual workspaces that allow employees to provide their vital contribution without physically clustering together. Today, the new paradigm is "move work to the workers, rather than workers to the workplace." Remote work increases the talent pool, reduces turnover, lessens the real estate footprint, and improves the ability to conduct business across multiple time zones, to name just a few advantages. As Fried and Hansson explain the challenges and unexpected benefits of this phenomenon, they show why--with a few controversial exceptions such as Yahoo--more businesses will want to promote this model of getting things done. JASON FRIED and DAVID HEINEMEIER HANSSON are the founders of Basecamp (previously 37signals), a trailblazing software company. They have been profiled in such publications as Time, Newsweek, and Wired. They're also contributors to Signals v. Noise, one the of Web's most popular blogs. 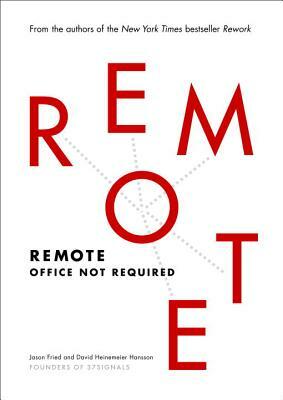 "Remote is the book that 21st century business leaders have been waiting for: a paradigm-smashing, compulsively readable case for a radically remote workplace. If you're intrigued by extreme teleworking, but have your doubts, Remote is the place to address them. Not a day goes by that I don't think about, talk about, and actually apply the insights in this game-changing book." "Just like we couldn't imagine a cell phone smaller than a toaster in the 1970’s, some companies still believe that they can't get great performance from their employees unless they show up at an office. Virtual work is the wave of the future, and Jason and David do a brilliant job of teaching best practices for both employees and employers." "The decentralization of the workplace is no longer fodder for futurists, it's an everyday reality. Remote is an insight-packed playbook for thriving in the coming decade and beyond."